On Saturday 20 April 2019 from 14h00 to 18h00. 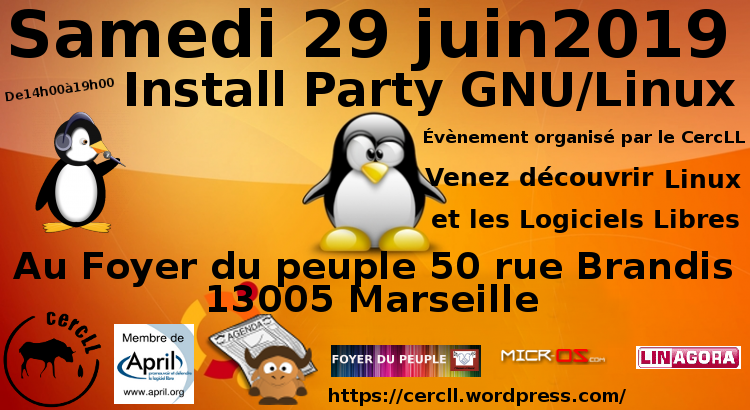 L' association CercLL organise deux ateliers découverte LibreOffice le 11 mai 2019 et le 15 juin 2019 de 14h00 à 18h00 au Foyer du peuple 50 rue Brandis 13005 Marseille. Yves Specht (de l’associationCercLL) vous propose de découvrir un logiciel de traitement de texte pas à pas à partir de travaux pratiques. Votre participation à cet atelier vous permettra de maîtriser non pas tel ou tel traitement de texte mais tout type de traitement de texte car vous aurez découvert les fonctionnalités qui existent d’une manière générale dans ces logiciels à travers une pratique personnelle. On Saturday 15 June 2019 from 14h00 to 18h00. L' association CercLL organise un atelier découverte LibreOffice le 15 juin 2019 de 14h00 à 18h00 au Foyer du peuple 50 rue Brandis 13005 Marseille. On Saturday 2 February 2019 from 10h00 to 18h00. On Saturday 5 January 2019 from 10h00 to 18h00. On Saturday 3 November 2018 from 10h00 to 18h00. On Saturday 6 October 2018 from 10h00 to 18h00. From Saturday 6 October 2018 at 09h30 to Sunday 7 October 2018 at 22h00. On Saturday 1 September 2018 from 10h00 to 18h00. On Saturday 5 May 2018 from 10h00 to 18h00. On Saturday 7 April 2018 from 10h00 to 18h00. On Saturday 13 January 2018 from 15h00 to 19h00. On Saturday 21 October 2017 from 15h00 to 20h00. On Saturday 16 September 2017 from 14h30 to 17h30. On Sunday 10 September 2017 from 10h00 to 18h00. On Saturday 14 January 2017 from 15h30 to 18h30. On Friday 9 December 2016 from 18h30 to 22h30. On Friday 22 July 2016 from 17h30 to 19h30. On Friday 17 June 2016 from 17h30 to 19h30. On Saturday 14 May 2016 from 14h30 to 18h00. On Friday 13 May 2016 from 17h30 to 19h30. On Saturday 16 April 2016 from 14h30 to 18h00. On Wednesday 6 April 2016 from 17h30 to 19h30. On Friday 19 February 2016 from 17h30 to 19h30. On Friday 15 January 2016 from 17h30 to 19h30. On Saturday 19 December 2015 from 18h00 to 19h30. On Friday 13 November 2015 from 17h30 to 19h30. On Saturday 24 October 2015 from 14h30 to 18h00. On Friday 9 October 2015 from 17h30 to 19h30. On Friday 4 September 2015 from 18h00 to 20h00. On Thursday 25 June 2015 from 19h00 to 21h00. On Friday 22 May 2015 from 17h00 to 19h30. On Thursday 7 May 2015 from 17h30 to 19h30. On Saturday 11 April 2015 from 14h30 to 17h30. On Friday 10 April 2015 from 17h00 to 20h00. On Saturday 21 March 2015 from 14h30 to 17h30. On Saturday 14 March 2015 from 14h30 to 17h30. On Friday 13 March 2015 from 17h00 to 20h00. On Saturday 11 October 2014 from 14h30 to 17h30. On Saturday 13 September 2014 from 14h30 to 17h30. On Saturday 30 August 2014 from 14h30 to 17h30. On Saturday 26 July 2014 from 14h30 to 17h30. On Saturday 14 June 2014 from 14h30 to 18h00. On Saturday 16 November 2013 from 15h00 to 17h30. On Wednesday 22 February 2012 from 18h30 to 21h30. On Friday 27 January 2012 from 16h30 to 21h00. On Saturday 10 December 2011 from 16h00 to 21h00. On Friday 18 November 2011 from 16h00 to 22h00. On Friday 4 November 2011 from 18h30 to 21h00. On Thursday 3 November 2011 from 18h30 to 20h00.